We did know what this place serves. 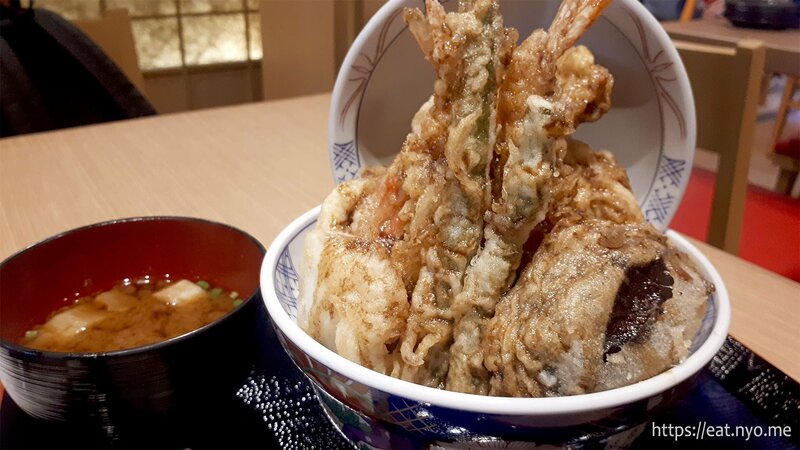 Tendon, for the uninformed, is short for Tenpura-Don, or literally “tempura rice bowl”. While we did expect this, what we didn’t expect was that they actually serve quite a few variants of tempura aside from the usual (black tiger) prawn. We also noticed that they serve other things not tempura or not a rice bowl; in fact, we ordered one of those things. 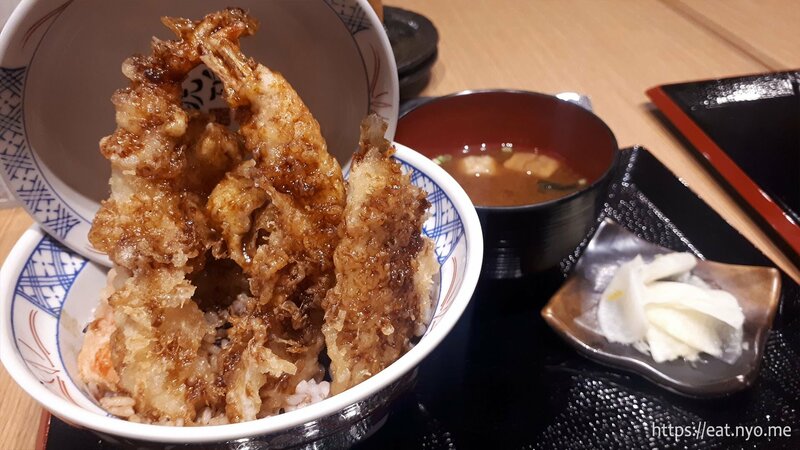 Firstly, I got their Kokahu Tendon (340 Php), not to be confused with the restaurant name, which is in the opposite order, which I had upgraded to grain rice (30 Php) and had the original sauce. My Betrothed got their Seafood Tendon (480 Php) and also upgraded it to grain rice (30 Php) but had the sauce spicy. Finally, we also got their Kitsune Udon (280 Php) since my Betrothed loved udon and I loved beancurd. The unexpected item in their menu that we ordered, their Kitsune Udon was a simple dish. It’s basically udon served in a light soy broth with abura-age, or thin, deep fried tofu on top. Apparently, I’m a “kitsune” or fox (which the dish is named after due to folklore belief that foxes like abura-age) because I very much enjoyed the beancurd topping, something that Marugame Udon doesn’t offer. My Betrothed liked the chewy udon, but was sad to learn that there’s not a lot of noodles in here. However, since we did order another dish apiece, it wasn’t really a setback in terms of getting full. I enjoyed this so much that I’d order this again if it wasn’t as expensive. 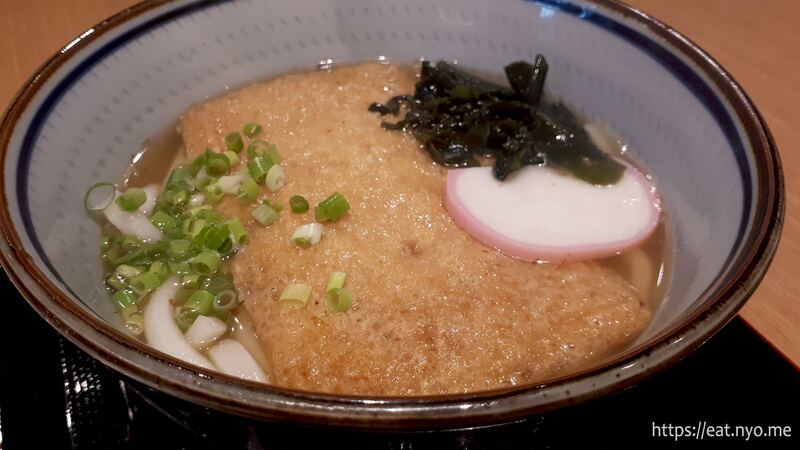 The Kohaku Tendon, their namesake dish, is rightfully named. They basically put in most of their unique ingredients inside: wild tiger prawns, squid, crab stick, chicken breast, green beans, shiitake mushrooms, young corn, and pumpkin. All of these were cooked tempura-style, or deep fried in cold flour batter. It is then coated in the aforementioned “original sauce” which was quite sweet and savory. After the crunchy sauce-covered exterior, you get a nicely cooked ingredient underneath, tasting what you’d expect them to taste. While the amount of toppings justified the expensive tag, I only liked the prawns and the veggies. In fact, I enjoyed the veggies much more than the included protein, including the prawn. The chicken breast was… okay. The first bite was surprisingly great. It’s quite moist, but it was a bit too thick and eventually, it tasted just another cut of chicken breast. The rest of the included protein was forgettable for me, and the various veggies were much more memorable. My Betrothed’s Seafood Tendon, I think, is their most expensive bowl. It has wild tiger prawns, scallops, kisu or Japanese whiting, tuna, squid, and an oyster. All of these had the similar crunchy exterior. However, the sauce her bowl is smothered in was a spicy one. There’s a tolerable spice in the beginning but it slaps your palate once it’s down your throat. Mostly protein, she let me taste most of the meat. I don’t mind any of them, but I also don’t prefer any, perhaps because of the sauce. She let me trade my chicken for her shrimp, which she prefers over most of the protein included in her bowl. I guess I should talk about the grain rice upgrade, since it’s part of both our bowls. I’m not really a big fan of rice that’s not coated in butter, but the hefty grains really did fill us up. They also tasted healthier, if that makes sense, so I’d recommend doing the upgrade especially for weight-and-sugar-watchers. As for the miso soup, well, it’s miso soup. Oh, there’s also pickled radish at the side of each order, which served as a nice palate cleanser, especially for the rich and/or spicy sauce. It’s actually uncommon for us to get full after dinner, especially me who does 16-8 intermittent fasting. However, Tendon Kohaku really did fill us up; granted, we did order an udon to share. Our bill amounted to 1,260+ Php after taxes and service charge, so it’s definitely one of our more expensive dinners. However, I find the experience worth it. Now, what would make me frequent this place more is if they offer a “build yourself” option, where I can choose the toppings. I’d pick their prawns, maybe three pieces of it, and put in a lot of veggies. I expect my Betrothed to put in the chicken, squid, crabstick and veggies (basically the Kohaku Tendon without the shrimp, and in spicy sauce, of course). Sadly, such an option is not available, so I don’t expect us returning anytime soon. Also, and perhaps ironically, the dish for the night for me was the Kitsune Udon, but that’s just because I really, really love beancurd. Still, if you’ve got some money to spare and want to get full and like the sound of what’s available, Tendon Kohaku is worth the try. Recommended for: Lavish tempura lovers. Not recommended for: Tempura haters. Smart nomnomnom tip: If not too hungry, the bowls are actually sharable.